music - Erin M. Jacobson, Esq. Seriously. Call me. I regularly work with legacy artists/songwriters/composers, heirs, and estates to protect and revitalize their catalogues. I assess what they own, what the current state of the catalogue is, and the various options for the catalogue to increase income while protecting the legacy of the creator and the works. Decisions involving how to move forward with a catalogue can’t be made if one doesn’t know what (s)he has to work with. The first step is to know what compositions are in the catalogue, what agreements are in place, and who is collecting the income. If the details are fuzzy, don’t worry. Most heirs and estates do not have previous experience with music catalogues and start with a vague idea. It’s my job to assist in making those fuzzy details become clear so that my clients know what they have, what options are available, and implement a plan to move forward. Not only are the details of most inherited catalogues fuzzy, but the money is too. Most older catalogues have a lot of mistakes in the maintenance and management of the catalogue which prevents the catalogue from reaching its earning potential. I’ve worked on catalogues with 50-year old mistakes not corrected by the current owner, problems with chain of title, improperly handled derivative works, and more. I fix the problems and get income flowing again. Copyright law provides a valuable gift to authors and heirs, which is the right to recapture ownership of copyrights. That’s right — authors and their heirs can reclaim ownership and control over their rights and how they are exploited. However, this gift comes with strict requirements as to when and how rights can be recaptured. (See articles with more information hereand here.) An attorney with extensive experience in copyright terminations is essential here, because there is only one chance to recapture rights – and that chance is lost if deadlines are missed or the procedure isn’t followed correctly. Decide a Plan of Action. There is only one chance to reclaim ownership of a catalogue and revitalize it – and the catalogue deserves it. Please contact me to assist you in taking care of your legacy catalogue. * Information stated is based on past experiences. Results are not guaranteed. 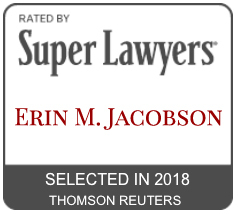 As previously announced, I have been named one of the Top Women Attorneys (Rising Stars) in Southern California for 2018 by Super Lawyers. The listing for this honor is in this month’s Los Angeles Magazine. Thanks to my colleagues and Super Lawyers for selecting me. Erin M. Jacobson, Esq. named one of the Top Women Attorneys in Southern California by Super Lawyers. There has been a lot of buzz lately about songwriters and artists (and their heirs) reclaiming thei copyrights and striking new deals or self-administering/self-releasing. What many want to know, is who can reclaim copyrights and how? There are certain provisions in the copyright law where, under certain circumstances, an author or that author’s heirs can reclaim copyrights that have been granted away at some time in the past. It’s a really complicated section of the law, and not all attorneys are well-versed in it, so it is important to make sure whoever you hire really knows the intricacies of filing terminations. For purposed of this article, I’m going to go over the basics. Section 304c applies to copyrights and grants before January 1, 1978. Termination under this section can be effected between 56 and 61 years after the original date of copyright, and termination may be effected in regards to one author’s share of the work. Section 203 applies to grants made after January 1, 1978, regardless of the original copyright date of the work. Grants falling under this section may be terminated between 35 and 40 years after the grant date. If the grant includes the right of publication for the work, then that five-year period begins either on 35 years after the date of publication, or 40 years after the date of the grant, whichever is earlier. Note that under Section 203, grants signed by more than one author require a majority of those authors or their heirs to terminate the grant. It is not like section 304, where one author’s share can be terminated independently. However, there are exceptions to this rule if separate grants were signed, such was the point at issue in the Victor Willis/ “YMCA” case. If the author’s share is being terminated by the author’s heirs, those heirs must make up a majority (at least 50%) of that author’s termination interest. When you want to effect a termination, you actually have to send a notice to the current owner of the copyright in advance of the termination date. This notice must be served not more than ten, but not less than two years before the effective date of termination. If you miss this notice window, you lose your right to terminate. The notice must be recorded with the Copyright Office before the effective date of termination to be valid. Works made for hire or grants by will are not eligible for termination. Termination is a matter of law, so it can be affected regardless of any contract or agreement to the contrary. Why is the right to terminate important? Recapturing rights and starting to exploit them again can revive older compositions or catalogs, and help them to start making money again when they’re currently lost and forgotten in the catalogs of large music publishers. Also, this increased exploitation (or an advance in a new deal) would mean more money for the authors or heirs. The decision whether to terminate must be carefully considered based on the catalog at issue as well as the situation of the authors/heirs. I regularly work with legacy clients and their heirs to determine the best plan for the catalog and filing termination notices, if that is the best choice for the client, so please contact me if I can help you with your catalog. This article was first published on Forbes.com. Spotify has waged a war with the music industry. The streaming company has a history of not paying mechanical royalties to songwriters and music publishers, and has already settled two separate class action lawsuits for failure to pay mechanical royalties – the first brought on behalf of music publishers by the National Music Publisher’s Association (NMPA) and the second, known as the Lowery/Ferrick case, brought by independent songwriters. Now, a host of top songwriters, including Tom Petty and members of Rage Against the Machine, Weezer, The Black Keys, and more, have come forward urging the court not to approve the terms of the Lowery/Ferrick case. These songwriters oppose the settlement amount in the Lowery/Ferrick case because when the costs are broken down, Spotify’s liability for not paying mechanical royalties would be to pay a mere $3.82 per infringed composition. The maximum liability under the law for copyright infringement is $150,000 per infringed composition. Quite the difference. As I previously reported, Spotify was also hit with two independent lawsuits – again for failure to pay mechanical royalties — brought by songwriter/publisher Bob Gaudio and music administrator Bluewater Services Corporation. Even more recently, seven other music publishers have sued Spotify for the same violation. The Gaudio/Bluewater suits accused Spotify’s practices being reminiscent of Napster, which caused Spotify to fire back with the outrageous claim that Spotify should not have to pay mechanical royalties to songwriters and music publishers at all. More realistically, Spotify has argued that copyright law does not define streaming and places the burden on the plaintiffs to show that Spotify is creating a “reproduction” and therefore required to pay mechanical royalties. As I explained in my last article, streaming requires several licenses – sound recording licenses from the record labels; performance licenses for the compositions from performance rights organizations such as ASCAP and BMI; and mechanical licenses for the reproduction of the compositions. Spotify now argues that it is akin to other streaming services like Pandora, who only have to pay performance royalties. However, Spotify’s argument is flawed for several reasons. First, Pandora and similar services online radio services are classified as non-interactive services because a user cannot choose to listen to a specific song on demand. This is similar to terrestrial radio, except it’s online instead of on the FM dial. In contrast, a Spotify user can choose and play any song the user wishes on demand, which makes Spotify an interactive service. Copyright law makes important distinctions between non-interactive and interactive services, and for the relevant purposes here, the most important difference is that non-interactive services are only required to pay performance royalties (as the use is only a performance, again, like terrestrial radio) and interactive services are required to pay both performance and mechanical royalties (because the nature of the technology actually consists of a reproduction of the data file in addition to the performance itself). Therefore, Spotify cannot rely on the requirements of a separately classified type of service when those requirements don’t apply to Spotify’s service. Second, Spotify has previously stated that it “needs” mechanical rights as part of its operations and has argued in rate court proceedings to weigh in on what mechanical rate amounts it should have to pay. It is both hypocritical and faulty reasoning for Spotify to say it needs certain rights and subsequently argue the opposite. Third, Spotify has previously settled the two class action lawsuits mentioned above in order to rectify its previous non-payment of mechanical royalties. Spotify’s excuse in these cases was that it was too difficult to pay everyone owed due to the lack of a comprehensive music industry database. Once again, Spotify previously accepted that it needed to pay mechanical royalties, but made excuses for its failure to do so, which is in direct opposition to its current claim that it does not need to pay mechanical royalties at all. Fourth, the music industry has long ago come to a consensus that an interactive stream does require a mechanical license and there is evidence that Spotify actually does create reproductions of the files, specifically on users’ mobile phones. While Spotify’s argument that a stream does not require a mechanical license was recently rejected in court, Spotify can still continue asserting that argument going forward. If a legal decision in Spotify’s favor set a precedent on this issue, it could mean massive losses of income to songwriters, music publishers, and the music industry as a whole. While there are several theories as to why Spotify has taken this approach, the simplest answer seems the most obvious – Spotify doesn’t want to pay. The scariest part of this whole situation is that with Spotify’s massive amount of funds, it has the power to continue litigating this issue with efforts to change the laws and practices of the industry to conform to its unwillingness to pay for the music it uses. It is unacceptable that Spotify has built its entire business on the usage of music content, but yet continually tries to get out of paying for the very content that sustains its customer base. Without music, there is no Spotify and it’s time Spotify stopped making excuses and started to value the music that built its business. The licensor is the person who owns the music and giving permission for it to be used in the audiovisual project. The music publisher owns the composition and the record label owns the master recording. Independent musicians might own both. The licensor’s information will also include the licensor’s ownership share of the composition or master that is the subject of the license. Also, the writers of the composition and their performance rights organization information will be listed. This is the person receiving the permission to use the music in the audiovisual project. This is usually a production company, studio, or network. Timing is how much of the song will be used in the audiovisual project; for example, it could be thirty seconds or an entire song. This is basically how the music will be used. There are many different terms thrown around to designate the type of use, but without using a bunch of industry-specific terms, examples would be playing in the background, with or without people talking over it; a live performance; played on a radio; an opening or closing theme; or in the credits. The territory covers where in the world can the music be used within the audiovisual project. This might be worldwide, for a specific country, or even a local area. The term is for how long can the music be used within the audiovisual project. This might be in perpetuity or only for a specific length of time. This is a big talking point because it includes the types of media in which the music can be used as part of the audiovisual project. This can include TV (and what types of channels), theatrical (movie theatres), film festivals, the Internet, all of these, or only some of these. The rights section also includes language about whether the music can only be used in the specific project itself, or also whether it can be included in promotions for the projects and if so, what types of promotions. Everyone’s favorite topic, i.e. the fee you are getting paid for the use of your music! This is going to be a negotiated fee based on the type of use, popularity of the song, and other factors. Direct performance rights are not present in every sync license, but are being seen more frequently. Basically, some licensees want to pay a buy-out fee of your performance royalties in an effort to move away from paying blanket license fees to the performance rights organizations (who would normally collect your performance royalties and pay those to you). One problem with this is that the licensees still have their blanket licenses with the performance rights organizations, so a buyout of performance royalties would leave you out of any income generated from performances over the amount of the buyout. This is for your attorney to handle! One should always have an experienced attorney look over any license you receive. Contact me if you have a license you need reviewed.